Ever wonder how to adjust the timing on your 1999-2005 Mazda Miata? Surprisingly you cannot adjust the factory timing by clocking a cam sensor like previous Miata's, until now! 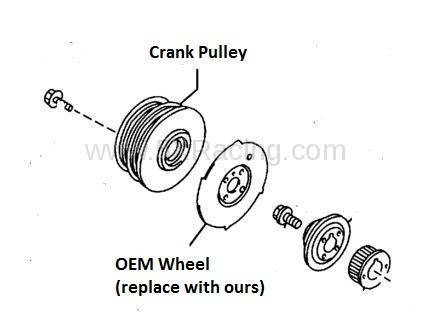 By simply replacing the factory timing encoder (timing) wheel that sits behind your crankshaft pulley with our specially designed slotted wheel, you can advance or retard your factory timing to meet your desired tuning needs. The 1999-2005 Mazda Miata engines based their ignition timing by way of a crankshaft position sensor. This sensor is simply an electromagnet proximity sensor that senses a passing "trigger", which physically are the four small tips you'll see on your stock trigger (timing) wheel. By allowing the timing wheel to be "clocked" (rotated within it's mounting location), we can now trick the ECU by triggering the crank sensor just a touch earlier (or later to delay it), which in turn will fire the ignition earlier, and consequently advance (or retard) your timing. Very complex in theory, yet very simply done! 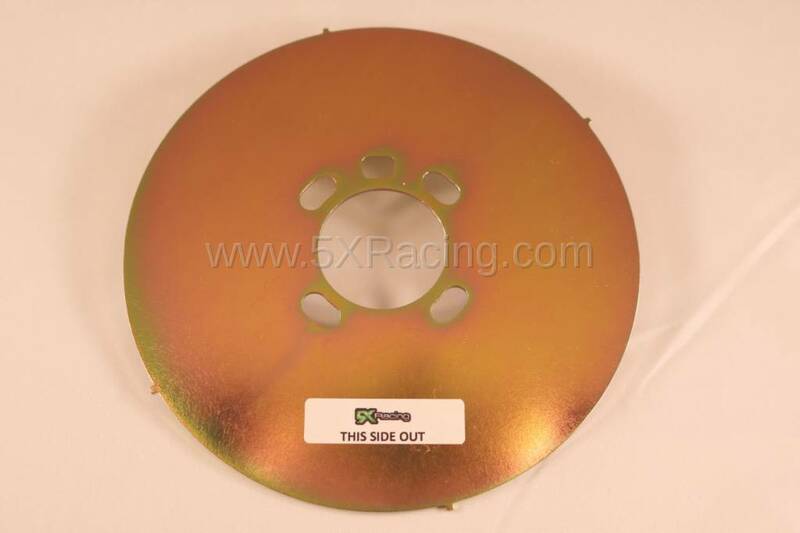 In the end this wheel will work perfectly in allowing you to advance your ignition timing to achieve better performance, or retard your timing to accommodate a turbocharger. How much performance you ask? 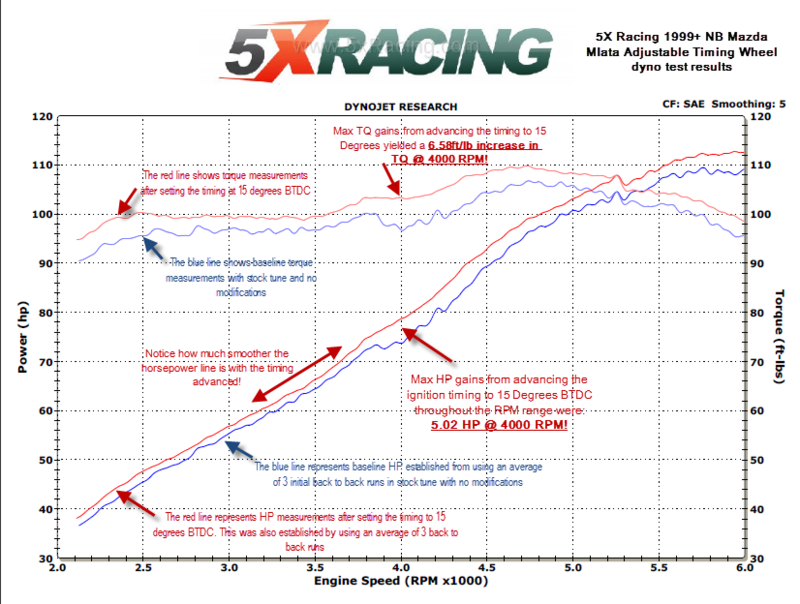 Check out our dyno results below! 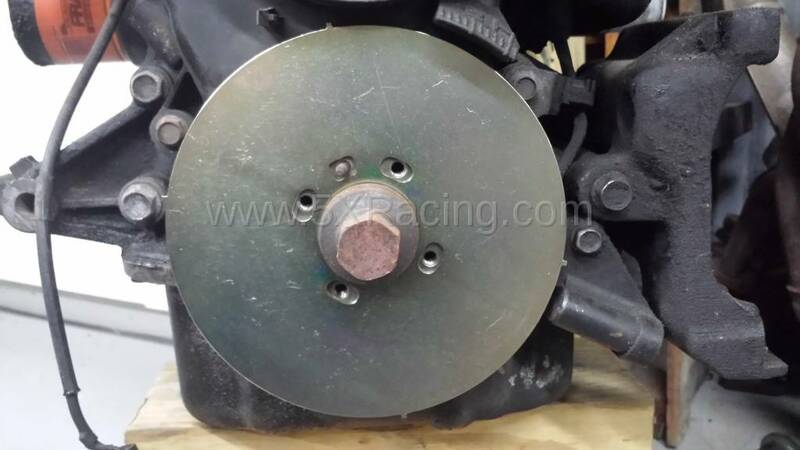 We have installed 5X Racings timing wheel on 2 NB Miatas. The first out of curiosity . The second out of neccesity to keep up with the first car. Two thumbs up !!! I wish I could get this much bang for the buck out of more expensive items. 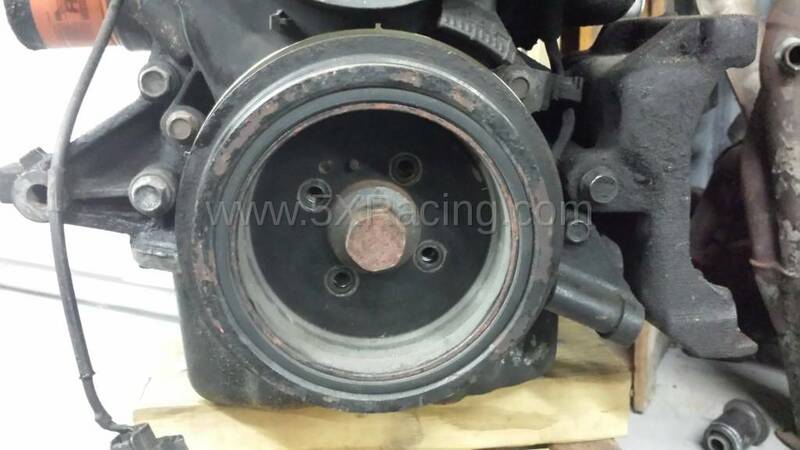 Installed the timing wheel which is a simple task, if you can change a belt, you are good to go. Engine is very eager to rev to fuel cutoff :-) Wow, what a great product for the price. Can easily feels the gains in TQ and HP. Way easier than trying to modify an existing wheel. Comes labelled so that you install it the right way! A must for anyone looking to adjust timing on the NB car. The install was very easy and the power gained was noticeable! It may have been a placebo, but I was able to chirp the tires between 1-2nd gear, with my father in the car. There seemed to be an increase in TQ, which makes sense with their dyno graphs. I recommend this to everyone! The power per dollar spent here is amazing! Also my mpg went from 31.221 to 31.431 comparing 10 tanks before and after.